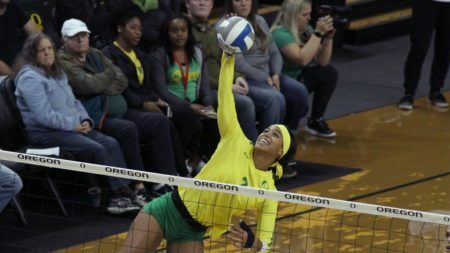 The 15th-ranked USC Trojans swept the Oregon Ducks 30-28, 25-23, 25-17 Friday night at Matthew Knight Arena. It was a script Oregon has followed on a number of occasions during the 2018 campaign. A hard fought first and second set wouldn’t go Oregon’s way down the stretch and then the Lady Trojans wasted no time in closing out the match with an emphatic third set win. The visitors out hit the Ducks .297 to .272, leading to a 53-45 advantage in kills. Lindsey Vander Weide led the way for Oregon, putting 13 balls on the floor. Ronika Stone added 11 kills. The win puts USC a game ahead of the Ducks in the conference standings at 9-4 to Oregon’s 8-5 mark. Overall, the Trojans improved to 17-7 on the year while Oregon saw an opportunity to sweep the season series slip away, falling to 15-8. 22nd-ranked UCLA is up next, visiting Matthew Knight Arena for a 12:00 pm date with the Ducks on Sunday.